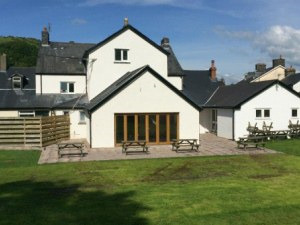 Glan yr Afon Riverside Restaurant01654 791285work RestaurantThe Glan Yr Afon/Riverside is a family run country pub; we very much lean towards being a restaurant. Glyn and I (Corina) bought the freehold in May 2010 and work together with our 7 year-old son Dylan and a great team of staff. We want the Glan Yr Afon/ Riverside to be a place where everybody is made to feel welcome whether it be for a quick pint or meeting with friends and family for lunch or dinner in the bar or restaurant. The Glan Yr Afon/Riverside is a family run country pub; we very much lean towards being a restaurant. Glyn and I (Corina) bought the freehold in May 2010 and work together with our 7 year-old son Dylan and a great team of staff. We want the Glan Yr Afon/ Riverside to be a place where everybody is made to feel welcome whether it be for a quick pint or meeting with friends and family for lunch or dinner in the bar or restaurant. In January 2011 we completed the refurbishment of the down stairs, restaurant, lounge, bar & cwtch, we've transformed the bar and cwtch (welsh for snug). Giving more comfortable seating for dining or just relaxing with the family, complete with a double fronted log burner offering the warmth and magic of watching a fire no matter where you sit on the colder days in Pennal. Well-behaved dogs are welcome in the bar and cwtch. We serve premium lagers and real ales over our bar –we have a guest ale in each week ranging from the Purple Moose Brewery – Dark side of the mouse, Glaslyn & Madog beers - Reverend James, Abbots Ale and plenty more. We also pride ourselves on an interesting and value for money wine list. By Car: From Machynlleth: At the T junction in front of the clock turn right, then just after crossing the bridge over the river Dyfi turn sharp left. Continue for approximately 3 miles before entering Pennal. After the Riverside pub and just before the bridge.